Middle Island in Australia, a beautiful, rugged and windswept outcrop off the coast of southern Victoria is home to a colony of the world’s smallest penguins. When foxes discovered little penguins, they killed nearly all the penguins. But a farmer came up with a novel way to protect the birds; he sent his dogs to protect the birds. We went from a point where we had around 800 penguins down to where we could only find four. In our biggest bird kill, we found 360 birds killed over about two nights. Foxes are serial killers. They’ll kill anything they can find, says Peter Abbott from the Penguin Preservation Project. Originally known as fairy penguins, 30 to 40cm tall, they’ve now been given the far more dreary sounding title of little penguins. There were hundreds of them on Middle Island, but that was before foxes got them. Witnessing the situation, a chicken farmer came up with a plan. He suggested sending one of his Maremma dogs to protect the birds. In Australia those dogs are generally used for chicken protection or goats or sheep. The dog, the first of several to be used on Middle Island, was called Oddball, and Oddball made quite an impact. Amazingly, since Oddball and his four-legged successors were introduced 10 years ago, there has not been a single penguin killed by a fox on Middle Island. The current dogs patrolling Middle Island are Eudy and Tula. They are the sixth and seventh dogs to be used and a new puppy is being trained up by Peter Abbott and his team. The dogs operate in the penguin’s breeding season, usually from October to March, when they spend five or six days a week on the island. The fairy penguin population has gone up to almost 200. 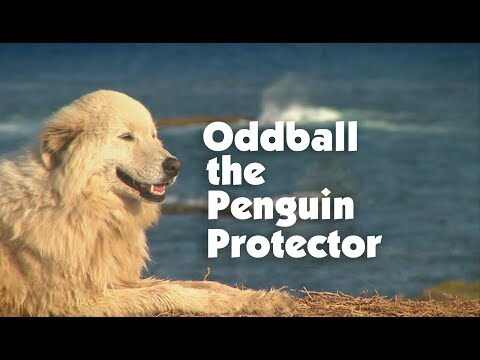 The project was so successful that a movie called Oddball has been made about it.